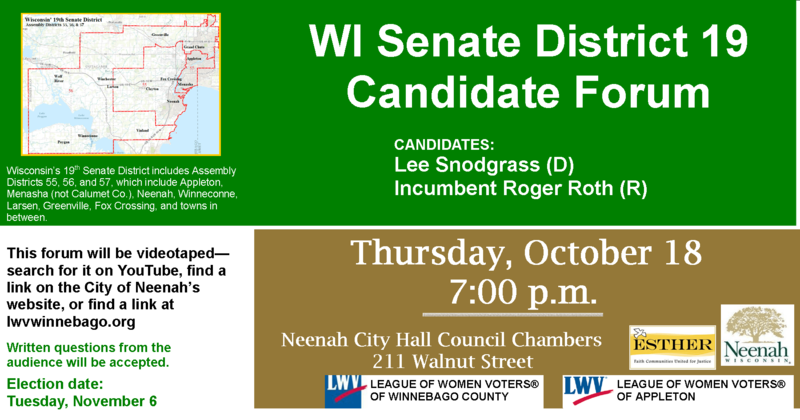 Attend this forum to learn more about these candidates and their positions on issues that are important to you. Then vote your values! Written questions will be accepted from the audience. Wisconsin’s 19th Senate District includes Assembly Districts 55, 56, and 57, comprised of Appleton, Menasha (not Calumet County), Neenah, Winneconne, Larsen, Greenville, Fox Crossing, and towns in between.